Today’s video is on the history of Frederic Chopin, a Romantic-era composer who wrote a bunch of remarkable music for the piano. We’ll talk about his life, his love, his personality, and in a separate video (coming soon!) we’ll discuss his music in depth. Most piano players aspire to play Chopin’s works, which are generally quite difficult (say for example..). Because Chopin is such a mainstay in piano repertoire, it’s helpful to get to know the man behind the music. If the word “History” reminds you of deep boredom in 10th grade, I hear you. This history of Frederic Chopin is lengthy, but that’s because he had such an interesting life. I don’t want you to walk away from this post/video with a head full of facts and dates. 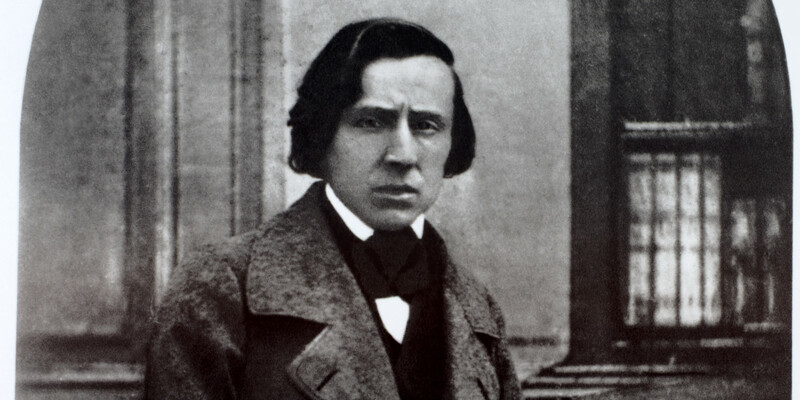 I want you to have a general idea of who Chopin was as a person, and how he lived his life. We have to start with a few basic facts, at the very least. Chopin was born March 1, 1810, and died October 17, 1849, meaning he lived to the ripe old age of 39. He was considered frail and sickly for most of his life, and likely died of tuberculosis. Chopin was born in Warsaw, Poland, and spent the first half his life there – the other half in and around Paris. If you’re a visual person and like maps (like me), this should give you a better idea. Keep moving West past Germany and you’ve got France, Chopin’s adult-life home country. Frederic was the only son of a Polish woman named Justyna, and a French man, Nicolas. He had an older sister and two younger sisters. As a child, Chopin’s first real piano teacher was Czech pianist Wojciech Zywny (Whoa-check Ziv-neh, you’re welcome), who taught Frederic from age 6 to 11. His older sister Ludwika also took lessons, and they would sometimes jam duets together. Chopin and Ludwika would remain close for all of his life, and she was one of the chosen few at his deathbed. Like Mozart and other famous composers before him, Chopin was a child prodigy. At 7, Chopin was giving public concerts and composing Polonaises (a Polish dance). He continued his musical education, and eventually joined the Warsaw Music Conservatory at age 16 to study theory and composition, all the while continuing to write and perform. He even performed for Tsar Alexander I, the emperor of Russia, who gave him a diamond ring for the performance. So now we’ve got to get into the more history-ish bits of Chopin’s past, but bear with me. Political events in Warsaw deeply affected Chopin’s life and his music. Having received success in Europe as a composer and performer at age 20, he set out to find a new place to live. He was young, he was talented, it was 1830. About a month after he left Poland, the November Uprising occurred. To put it briefly, it was an armed rebellion of the Polish against Russia. Despite Lithuania, Belarus and Ukraine pitching in to help Poland, Russia eventually won, declaring Poland a part of Russia. This news would crush Chopin, who was quite the nationalist. He had a great love for his homeland, and wrote many tormented pieces of music about his despair. Chopin was nostalgic for his homeland and “cursed the moment of his departure”. When the uprising was defeated in 1831, Frederic was broken-hearted. Even though he spent nearly 20 years and virtually all of his adult life in France, he always considered himself Polish at heart. Polish at heart, literally. He requested that upon his death, his heart be returned to Poland. His sister Ludwika obliged this, taking his heart back in a jar of alcohol. But we’re getting ahead of ourselves. By the end of 1832 he was part of the French musical elite, among others such as Liszt and Berlioz. The two great composers became friends, and for many years lived a few blocks away from each other. They even performed together a couple times. But their friendship wasn’t all roses. Apparently Frederic was a little “jealous and spiteful” of how awesome Liszt was, and in 1843 Liszt played one of Chopin’s nocturnes with little frills and extra additions, which made Frederic angry, saying, “Play it the way it was written, or not at all”. These kind of discrepancies put a strain on their relationship, as you might imagine. Frederic was an anomaly of a musician in that he didn’t like performing – he only gave about 30 public performances in his lifetime. He did, however, perform at salons, which were basically big, fancy, intellectual parties. He also enjoyed playing for friends at his apartment. His music, in his opinion, was quiet and delicate (much like Chopin himself) and therefore not suited to a big concert hall. So instead of making a living by performing, like many musicians did, he composed and taught piano to rich kids. He also had several patrons who helped him out throughout his life. And it’s at this point in the history of Frederic Chopin where we must discuss George Sand, who was Frederic’s lover for 9 years, starting in 1838. And if you’re thinking that it was very modern of Frederic to be dating a guy, you’d be me. I spent years thinking that he was in a romantic relationship with another man, simply because of the name George. The truth is almost as exciting, though. George Sand was a woman and a writer. George Sand was merely her pen name. It wasn’t just her pen name that was “manly”, though. She did other things that, at the time, had a manly connotation to them, such as wearing men’s clothes for comfort, and smoking cigars. I, for one, am glad that it is considered common practice for women to wear pants. But that was just his way of saying, “This lady is so cool,” because two years later they officially began a relationship. Spoiler alert: This love story doesn’t have a happy ending. In the winter of 1838 they traveled to Majorca, Spain, in hopes of improving Frederic’s health. But when the very Catholic people of Majorca found out the two of them weren’t married, they were all, “You heathens aren’t sleeping under our roofs”. Frederic wrote a bunch of famous music that winter (including his Preludes), but the cold weather and crappy situation in Majorca was making his health worse, so George Sand said, “We’re hittin’ the road” (well probably in different words), and they returned to Paris. They continued dating but living apart, in nearby buildings. They both enjoyed having personal independence, and never shared a home (or married, for that matter). His relationship with George went downhill around 1846. So pretend you’re George for a minute. She had two kids (from another man), a son and a daughter. Frederic often took the daughter’s side in big mother-daughter arguments. Would that make you happy, or angry? In George’s case, it was the latter. Her son was overprotective and showed jealousy of Frederic’s involvement in his mother’s life, so that became an issue as well. But it was more than just squabbling. They didn’t really share the same views or interests, and as Frederic’s health declined, she ended up being more of a caregiver to him, inevitably breeding resentment. She even referred to him as her “beloved little corpse” in a letter to a friend. The final straw was when she wrote a story about a rich girl and a sickly prince, a story that was not unlike their own. In fact, it was a little too similar, and it painted Chopin in a very unflattering light. So they broke it off after 9 years, going their own separate ways. By the end of 1848, he was pronounced by doctors as terminally ill, and weighed about 100 pounds. Despite that, he gave occasional lessons and was visited by friends. By the end, his older sister Ludwika and her family came to stay with him, as well as his closest friends. Chopin, terrified of being buried alive, requested that his body be opened and his heart sent back to Poland, which circles us back around to the beginning of this story. Yes, Ludwika returned it to Poland. Yes, it was preserved in a jar of alcohol. Frederic died on October 17, 1849, at 39 years old. Mozart’s famous Requiem was sung at his funeral, and Frederic’s own very sad Preludes number 4 and 6 were also played. Thousands of people came to his funeral. But guess who didn’t come? Yup, George Sand. Now let’s talk a little about Frederic’s personality. He seems to have been drawn to big, sparkling, intense people such as Liszt and Sand, probably because his personality was opposite – small and sensitive. Not everyone had bad things to say about Chopin, though. She was close with Frederic, being one of the few at his deathbed. As a partner to this video on the History of Frederic Chopin, in an upcoming video we’ll talk about the music of Chopin – his writing style and key compositions, which were mainly for piano.